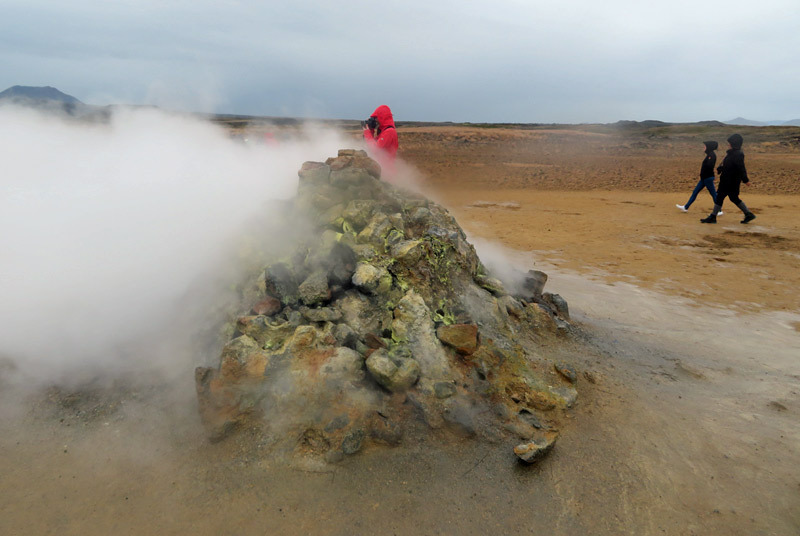 Bubbling mud pits, erupting geysers, glacial ice chunks on black sand beaches, volcanic craters, ocean-battered cliffs, overgrown lava fields, and the Northern Lights (!) were just some of the highlights of my recent visit to Iceland. 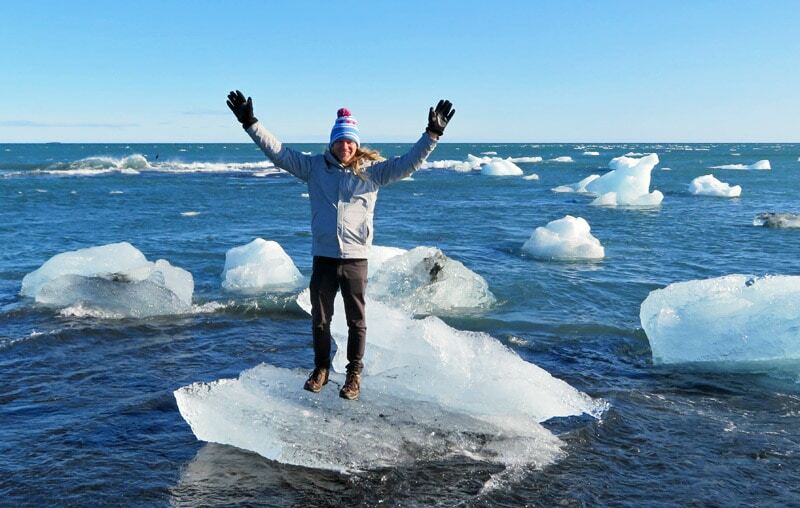 Iceland is known as one of the most beautiful countries in the world, and the Land of Fire and Ice did not disappoint. 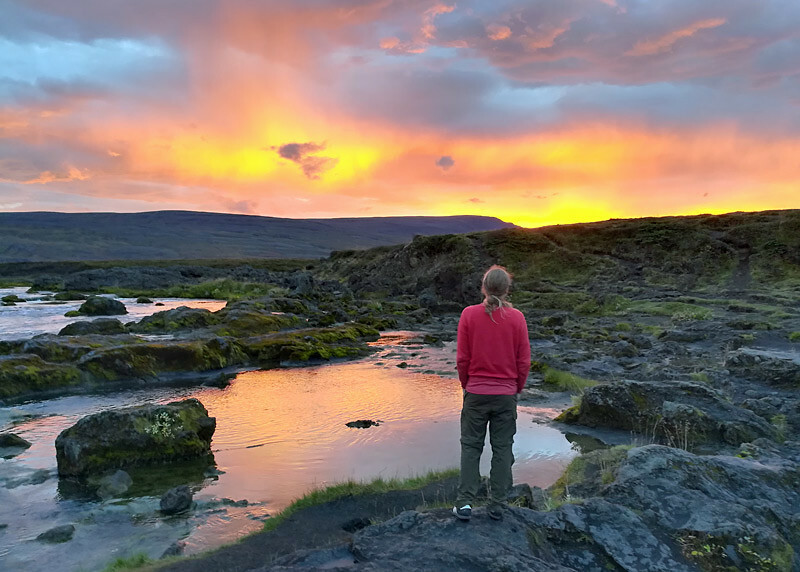 I spent 10 days there with my friend Jason, driving around the Ring Road and checking out the Snæfellsnes Peninsula and a small portion of the Westfjords. Next time, I need to stay for a month to see it all. 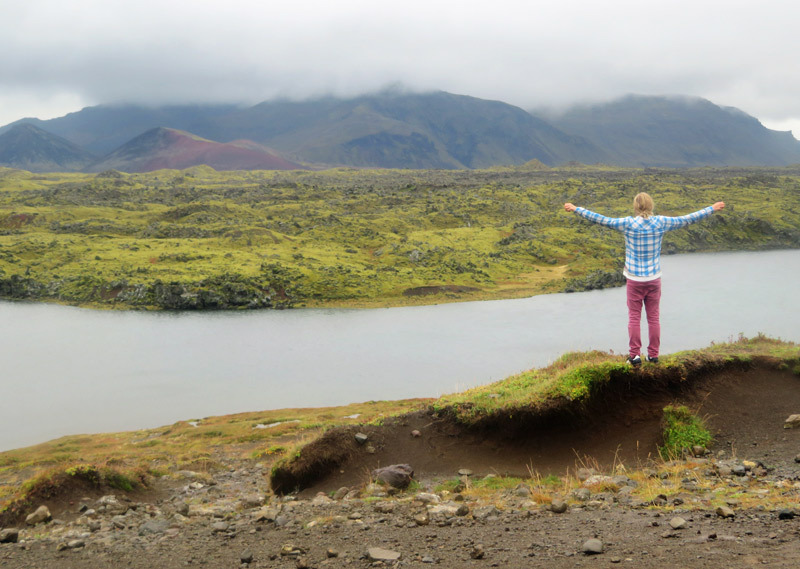 In the meantime, check out this recap of the 30 most amazing things I saw in Iceland. And keep reading all month for lots more photos and stories from this remarkable country! Here’s one of the few waterfalls for which I neglected to take note of the name. We stopped one afternoon to eat lunch at this set of cascading falls. I can’t remember the last time I ate in such an impressive setting! It was located about a 30-minute drive east of Modhrudalur. In eastern Iceland, there’s a mountain pass up a long gravel portion of the Ring Road. 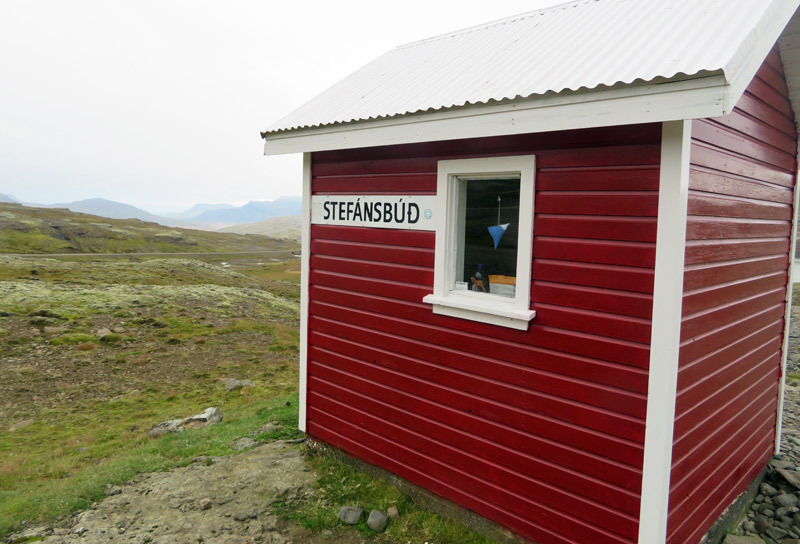 At the top of the mountain, we discovered this shed labeled “Stefansbud.” We poked around and learned that the door was unlocked, so we went inside. 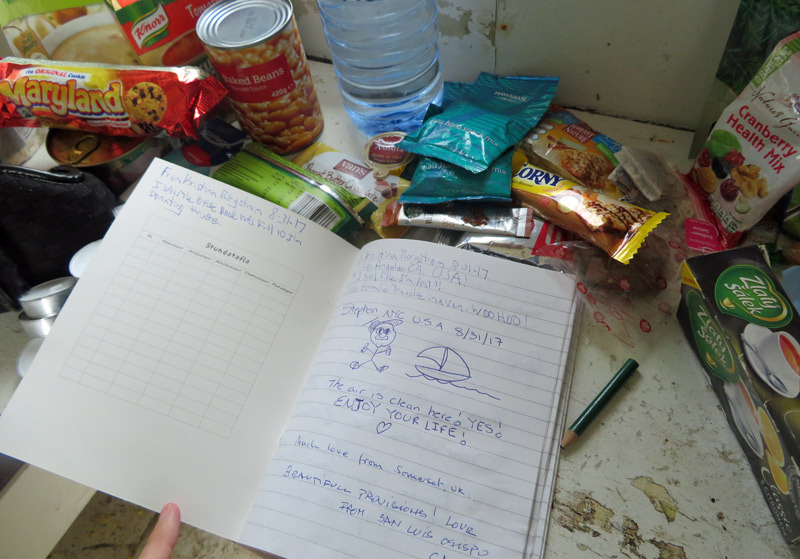 What we found was a guestbook signed by visitors from around the world, a bench to lie down on, and a bunch of snacks left for future travelers to use. How cool! Not all of the food was appetizing – who’s going to eat hard candy that has been sitting on a table for months?! – but its existence was a reminder of the friendly and cooperative nature of Icelanders and world travelers in general. In the far southeastern corner of Iceland, just before the Ring Road veers north, we encountered Hvalnes Nature Reserve Beach. 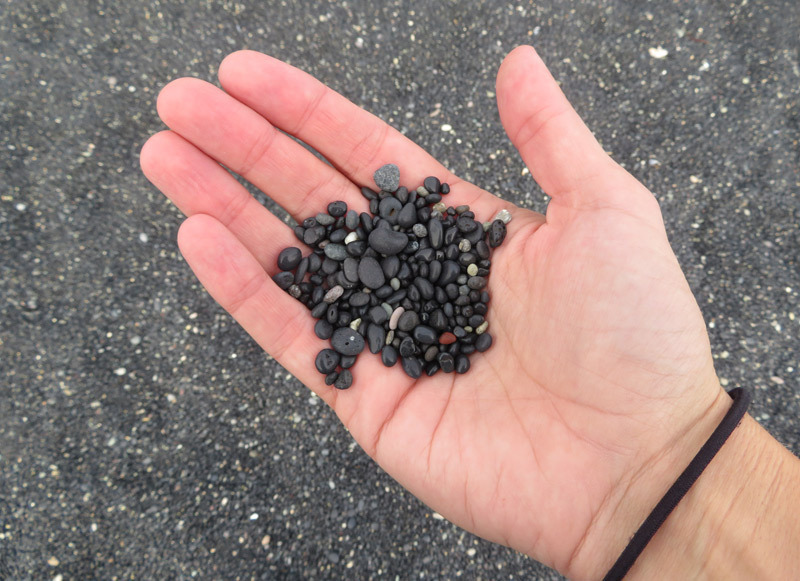 It’s a wide, sparse beach with trillions and trillions of tiny, smooth, round rocks. I was blown away trying to imagine how much weathering and erosion it must have taken over the years to give all the pebbles such a smooth, oval or circular appearance. We spent several minutes walking around Hvalnes Nature Reserve Beach, feeling the cool breeze and soaking in the beautiful sights, with the waves on one side and a large mountain on the other. Make sure not to skip the quick stop at Hvalnes when you’re circling the Ring Road. 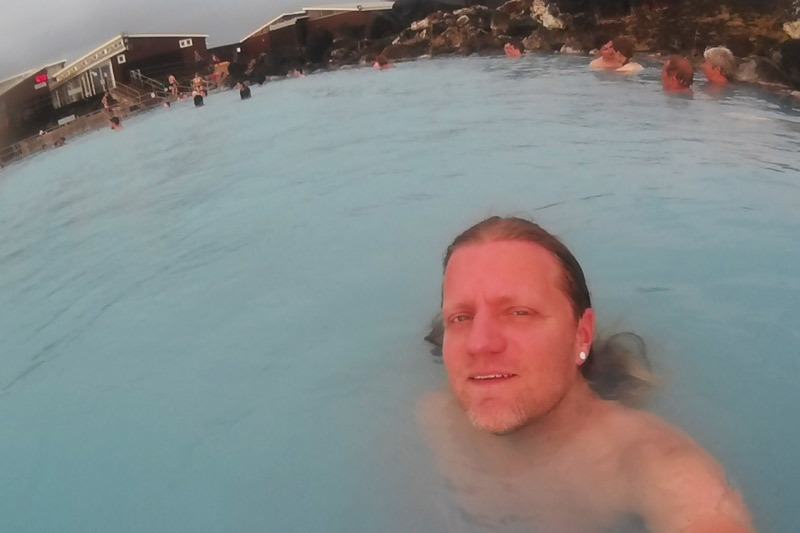 Like the more famous and more expensive Blue Lagoon, Myvatn Nature Baths is a man-made spa that utilizes geothermal waters to create a soothing pool. 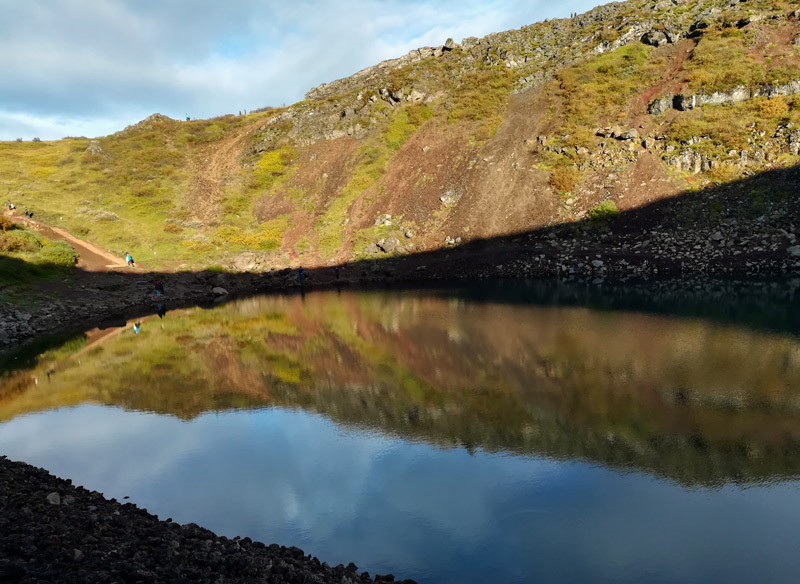 The water arrives at Myvatn with a temperature of 130° C and is cooled to a still-steamy 35-40° C.
If this list was titled “The 30 most amazing things I felt in Iceland,” Myvatn Nature Baths would rank #1. On a freezing, windy day, sliding into the warm waters and relaxing while surrounded by mountain scenery felt like paradise. Shark bits on my plate? That definitely qualifies as amazing. 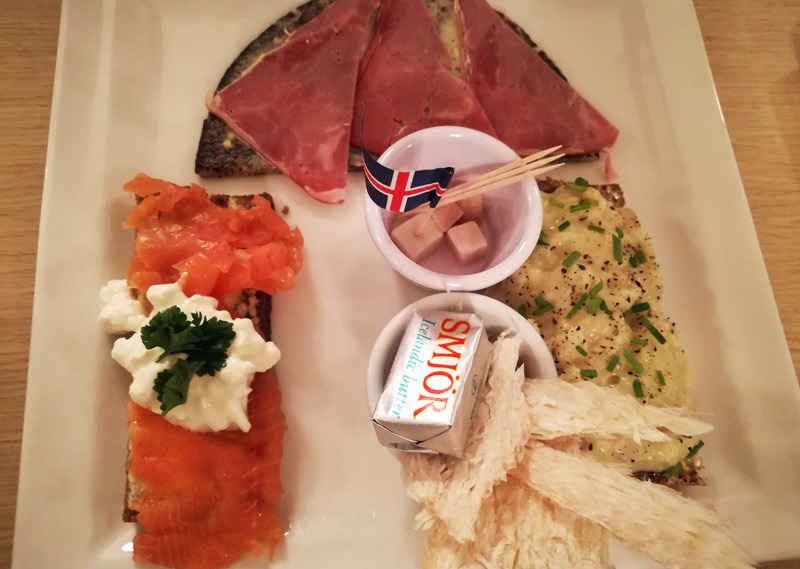 Restaurants in Iceland are super expensive, but we splurged once for a traditional Icelandic dinner, featuring lamb, tuna, and fishy mashed potatoes on rye bread, plus dried fish jerky and a few bits of hakarl, or fermented shark, in that little dish in the middle of the plate. Hakarl has an infamous reputation for being one of the world’s most disgusting foods, but I found that claim to be a bit exaggerated. To me, the shark was just mildly off-putting. It was like eating extremely bitter chunks of turkey. Iceland has no unusual wildlife in terms of land mammals, but they do have tons of sheep and horses roaming the country. Most aren’t wild; they are fenced in, or at least have ear tags so the owners can identify them. I kept trying to say hello to the sheep, but they kept scurrying away. 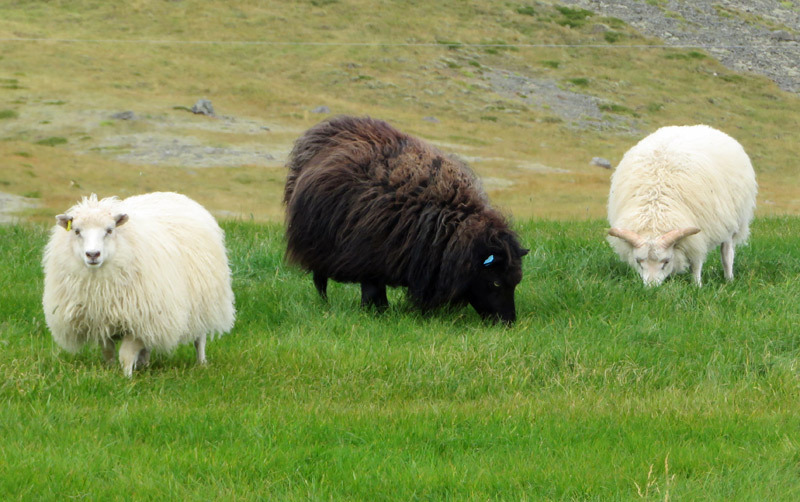 It seemed like about 10% of the sheep were black, which was cool since I had never seen a black sheep before. 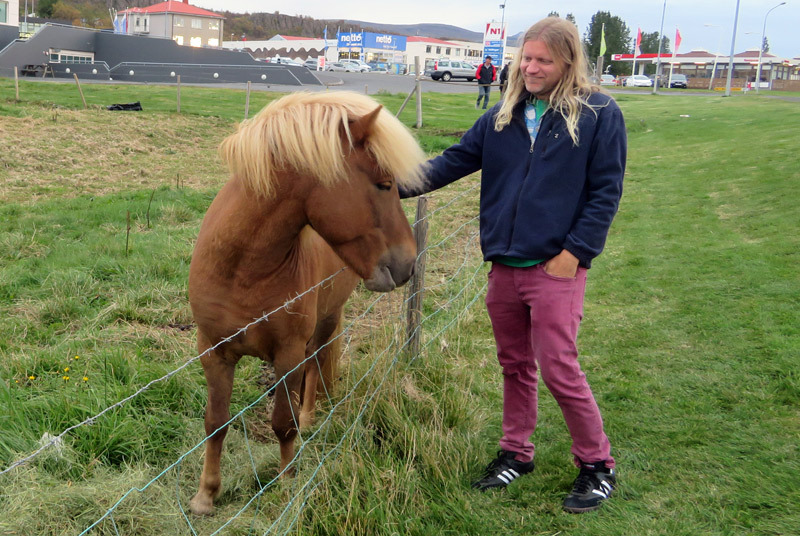 And the Icelandic horses are legendary with their gorgeous manes. Look, I found a fellow member of the long blond hair club! It takes a lot for something man-made to make this list. 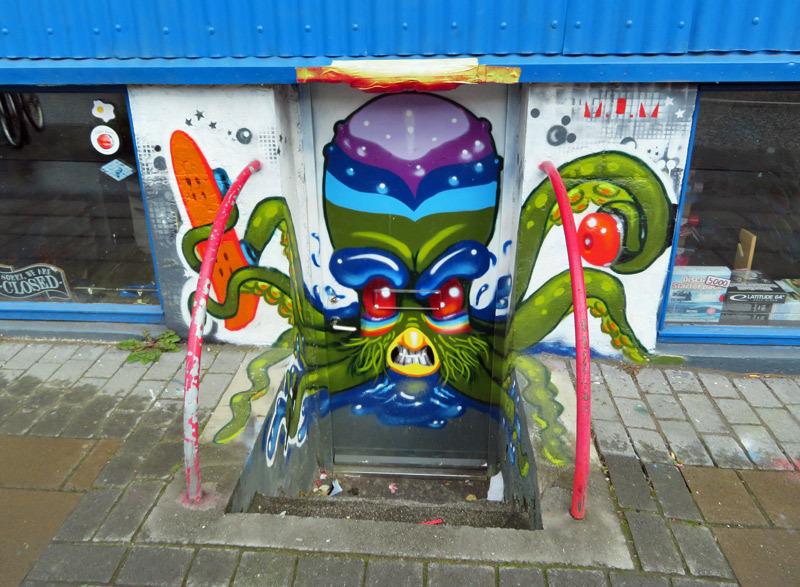 I’ve seen a ton of street art, and Reykjavik has some of the best. I could (and maybe will) do an entire photo essay just on the cool artwork on walls and buildings around the city. 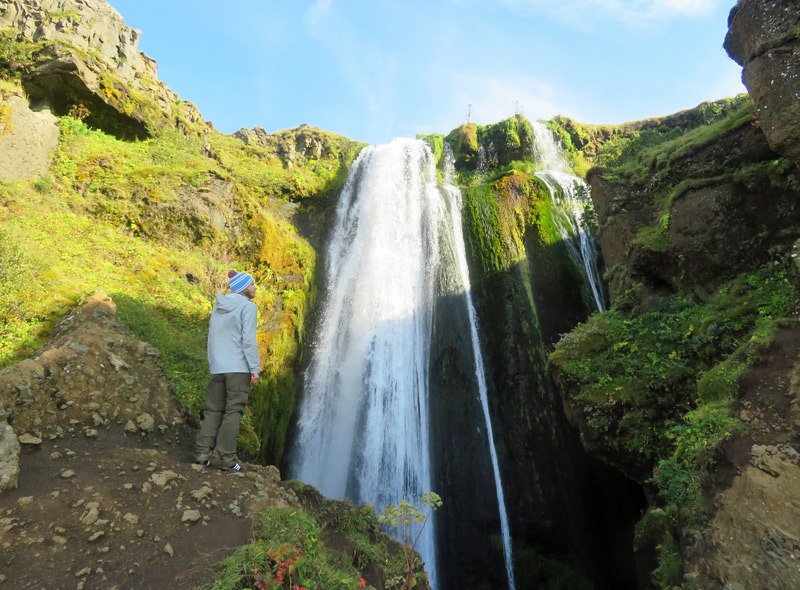 Located at the same site as the more popular Seljalandsfoss, Gljufrabui is a much smaller waterfall, but in many ways it’s just as cool. It’s hidden inside a canyon, so to see it, you either have to walk inside the canyon, or climb an adjacent hillside to view it from above. It’s the world’s largest collection of animal junk in jars! As its name implies, the Museum of the Phallus consists of the penises of various members of the animal kingdom, preserved in jars for all to see. 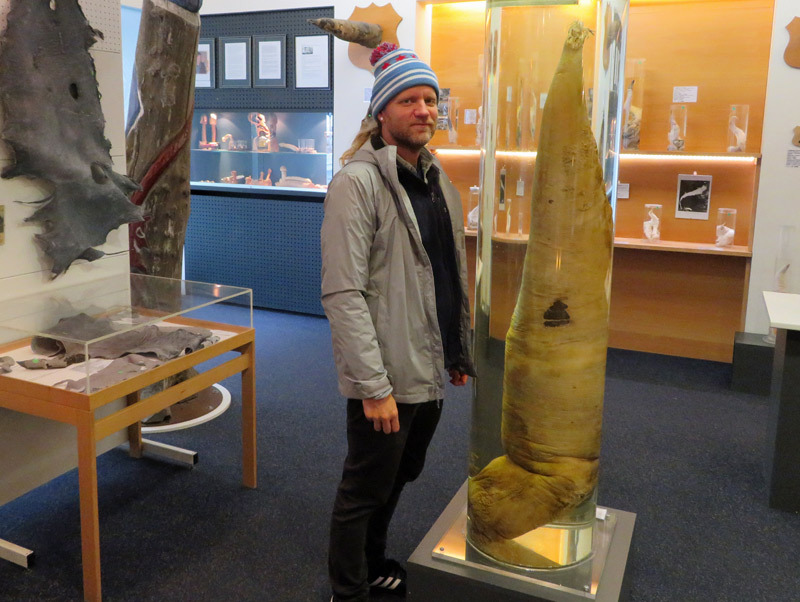 Most were in small containers, while some, like the sperm whale appendage above, were massive. This museum was very popular. I guess people love the novelty factor! 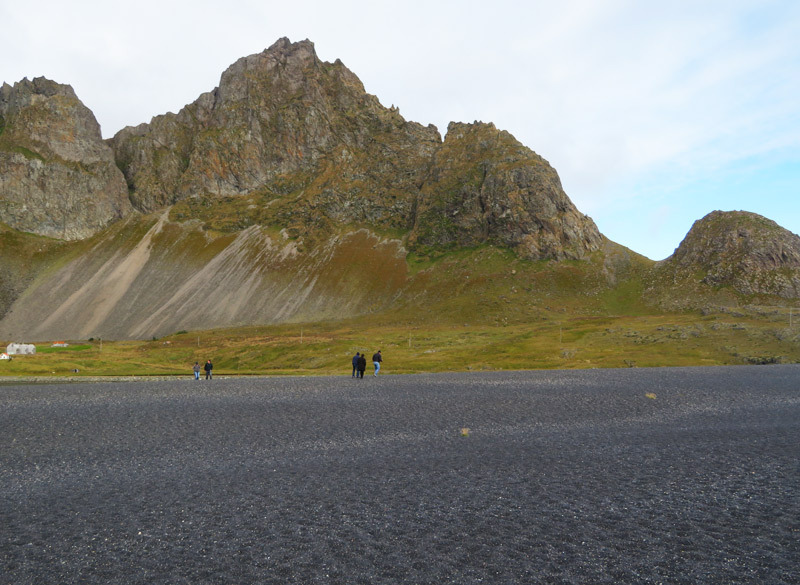 Grabrok, one of Iceland’s many volcanic craters, allows visitors to walk all the way along its rim. 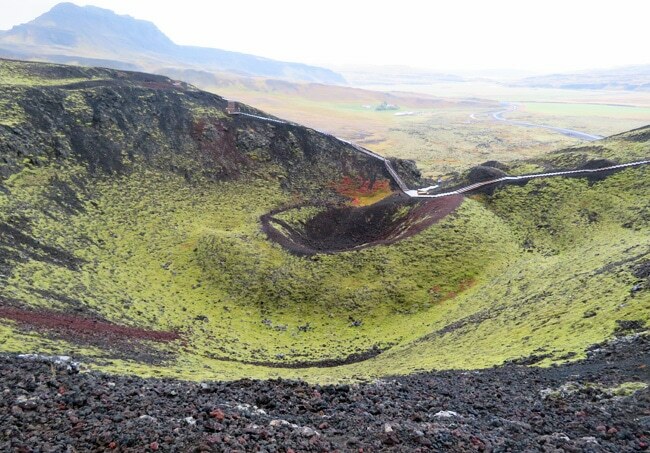 From up there, we could look down into the crater (formed during an eruption 3400 years ago) and out at the surrounding lava field. 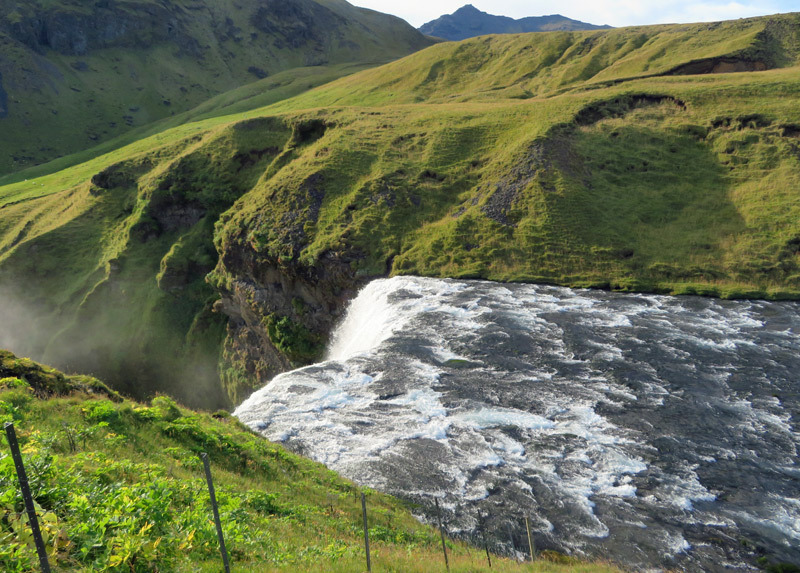 Iceland has so much natural beauty, but it doesn’t have a lot of forest. Hallormsstaðaskógur Forest Preserve in eastern Iceland was a wonderful exception. 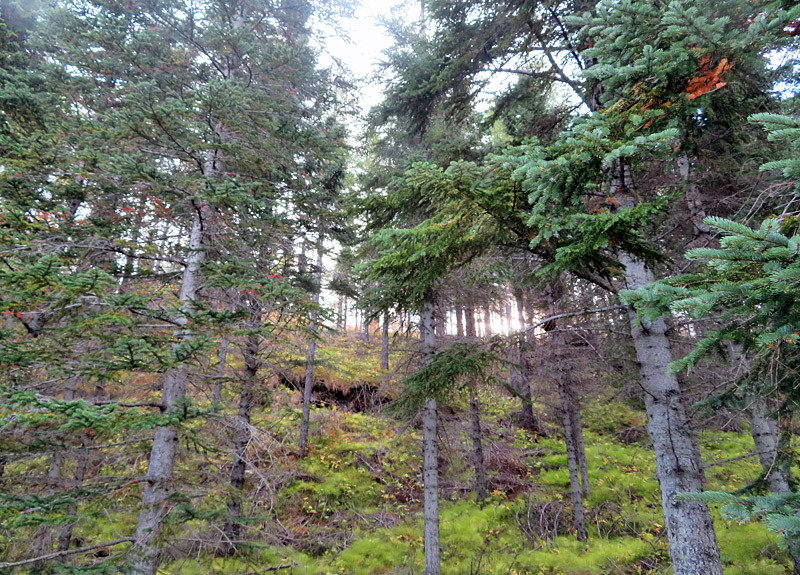 The protected area began as a birch forest, but over the years, various trees from Alaska and Russia were planted, many of which are noted in informational signs along the hiking trails. 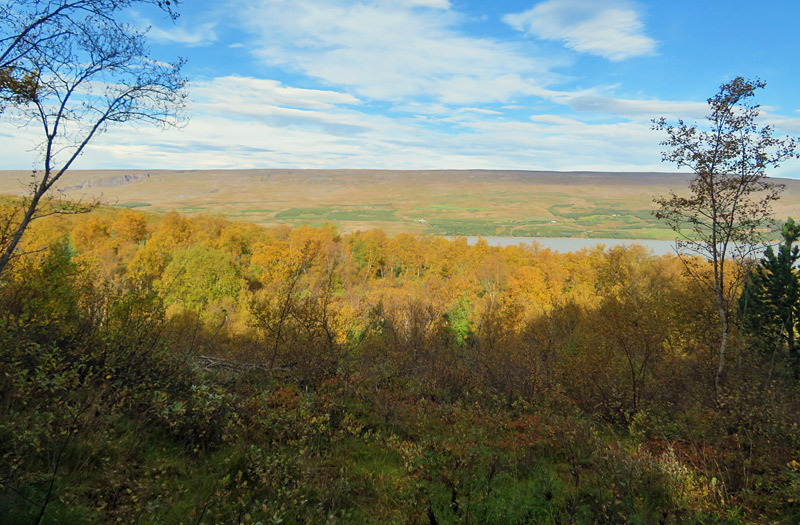 Hiking to the top of one of the short trails brought great views of the autumn trees and Lagarfljot Lake, one of the largest in this part of the country. 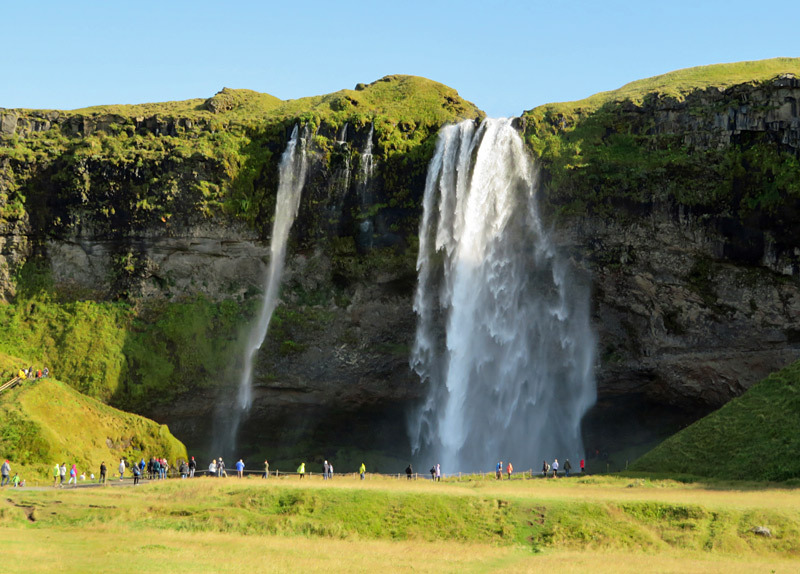 Skogafoss is sometimes referred to as a “curtain waterfall” because of the way its water pours down evenly, resembling a hanging curtain. This was one of the best places in Iceland to see rainbows. 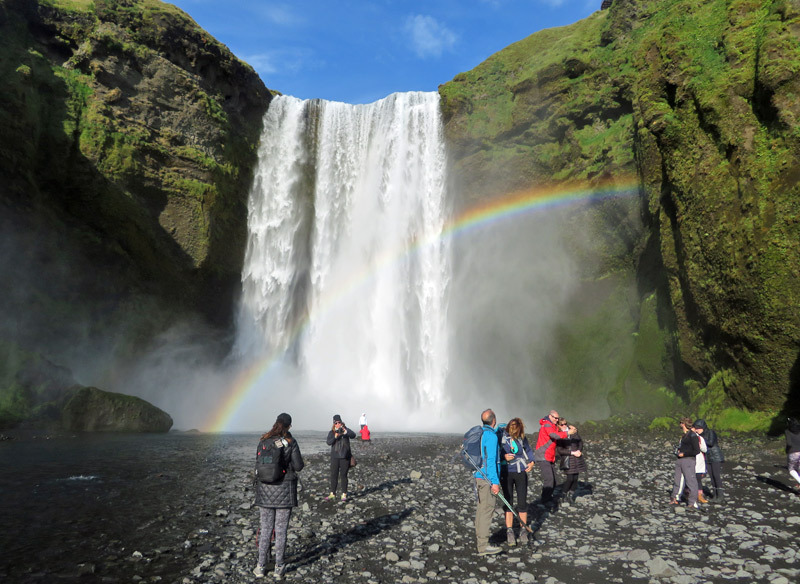 We took the optional climb up 527 steps to view Skogafoss from above, which offered a different perspective of the rushing water. 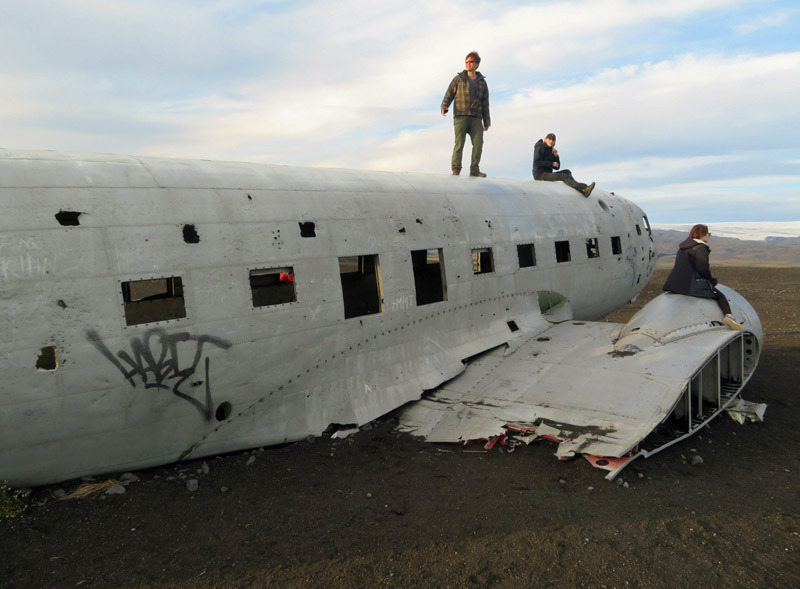 One of Iceland’s more unusual tourist attractions is the wreckage of a US Navy DC-3 plane that crashed on the beach in 1973. The pilots made a heroic landing and everyone survived, but the plane was not salvageable. So it remains here, decades later. This site was once a little-known destination, but not anymore. We joined dozens of others in making the 40-minute walk from the Ring Road (one way) to view the wreckage and take photos. 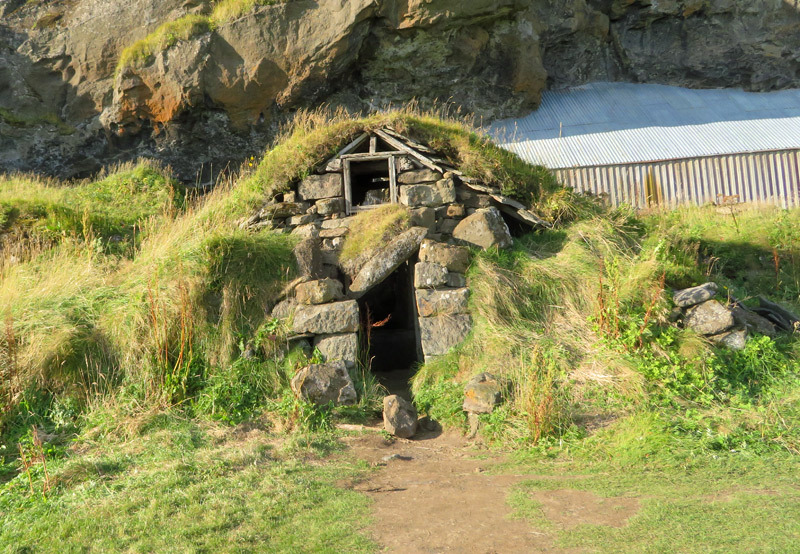 One of Iceland’s quirkiest sights was the turf house. This was a dwelling used by the early settlers to keep warm during the cold months. The ground served as the perfect insulation from the rain, snow and wind. Several of these houses can still be seen along the Ring Road. Talk about being one with nature! 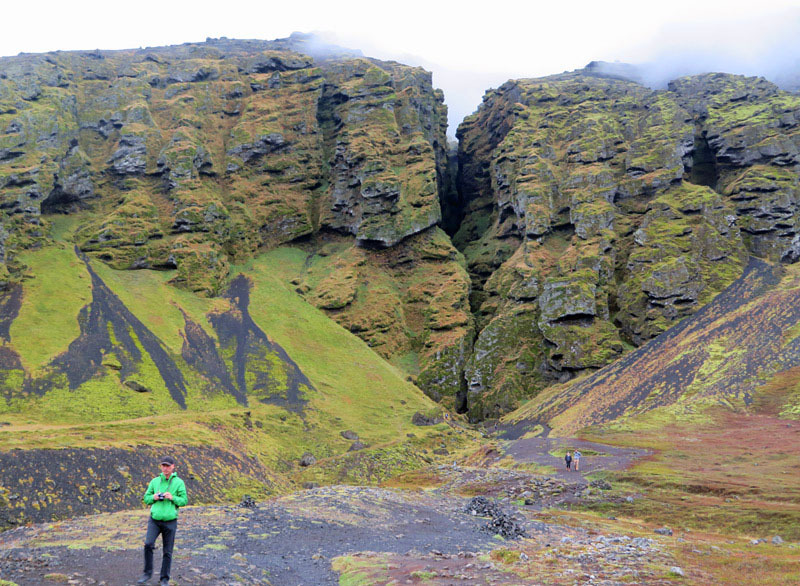 Many of our best Iceland discoveries were unexpected. We’d see a parking lot or pullout, then start walking until we found the hidden attraction. 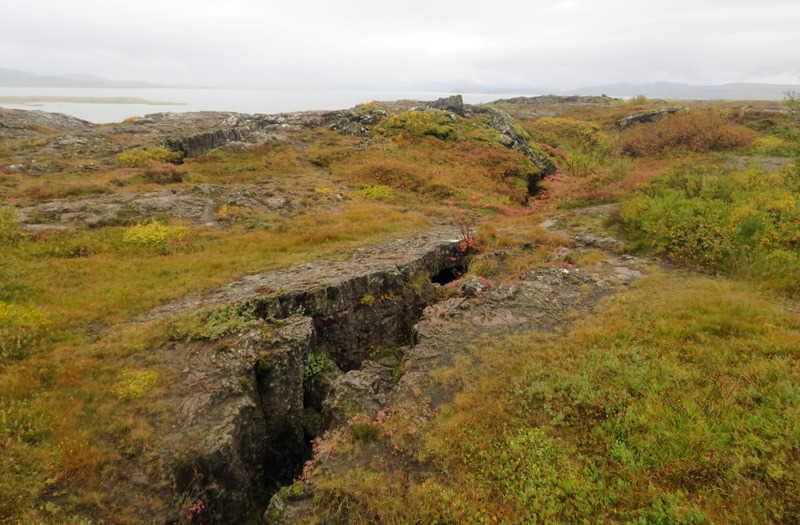 Such was the case with Raudfeldar Canyon. This canyon didn’t look like much from the outside, just a small crack in the mountain. 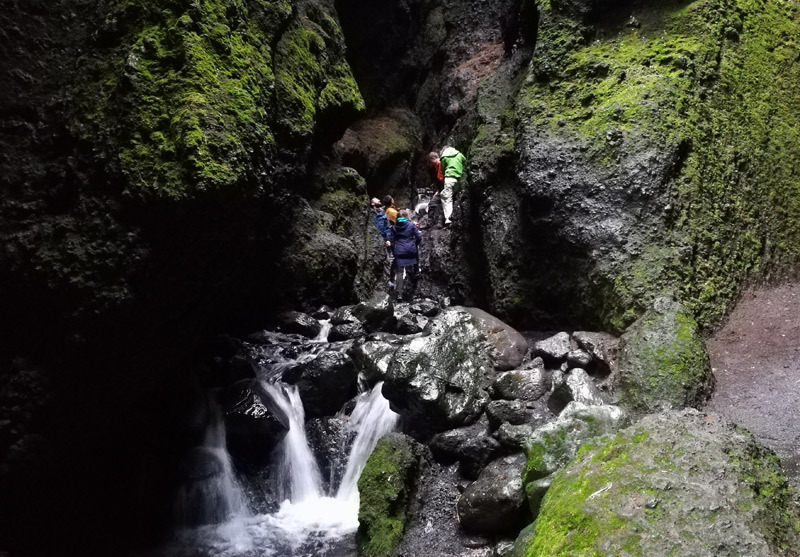 But inside was a narrow canyon with a small, rushing stream and a handful of people who decided to explore the canyon. It got narrower and more treacherous as we went deeper, but the feeling of being surrounded on all sides by rock was thrilling. Driving back to Reykjavik from Snæfellsjokull, we randomly pulled over and took a short walk down towards a lake. Soon we were rewarded with some of the best, wide-open views on the entire trip, with the lake in front of us and rolling volcanic hills on the other side. This spot was unmarked, so I’m not entirely sure what it was called. Looking at the map, it might have been Baulárvallavatn (Lake Baularvellir). If not, it was somewhere very close nearby on route 56. 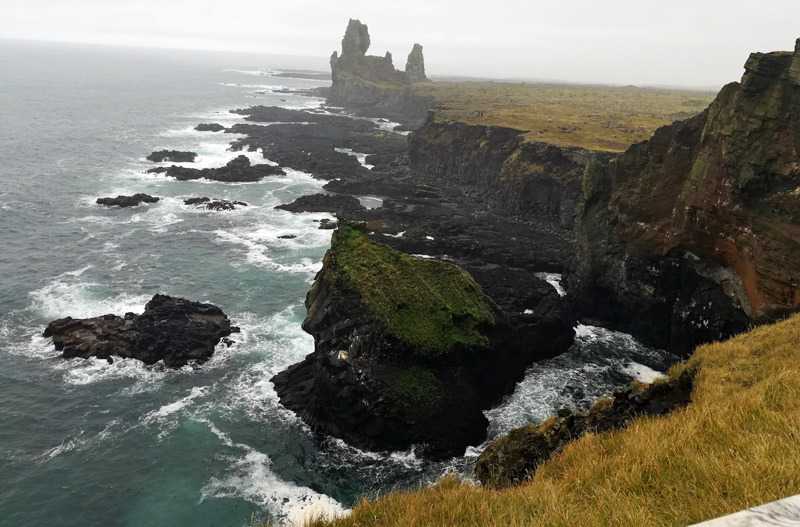 All the way west on the Snæfellsnes Peninsula are Thufubjarg and Londranger, volcanic crater remnants that serve as a great scenic lookout today. We probably would’ve enjoyed this spot more had it not been windy and rainy, but the killer views were undeniable. 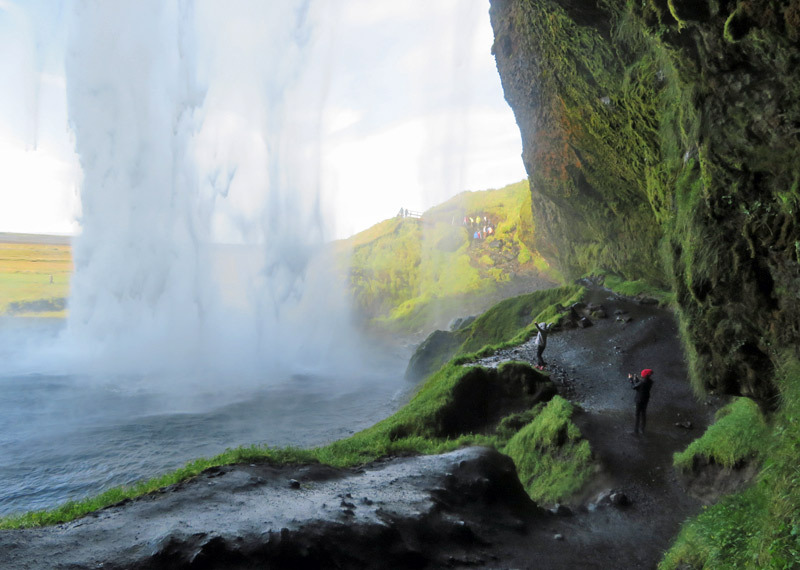 Seljalandsfoss stands out because it’s one of the few Icelandic waterfalls you can walk behind. 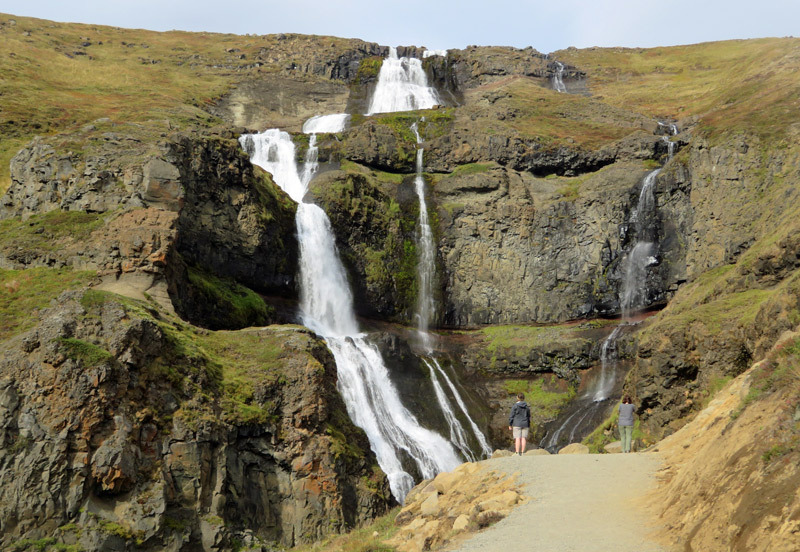 At roughly 200 feet high, the falls are visible from quite a distance away while driving on the Ring Road. When you finally get up close, make sure to wear a good rain jacket and follow the path that goes underneath the cliff and behind the falls. 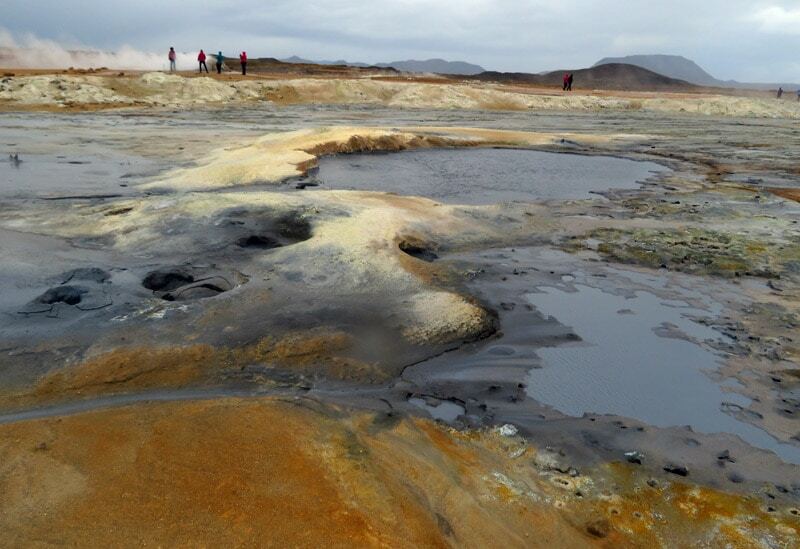 The Namafjall Hverir area of northern Iceland has a ton of geothermal activity, like boiling mudpots and fumaroles. 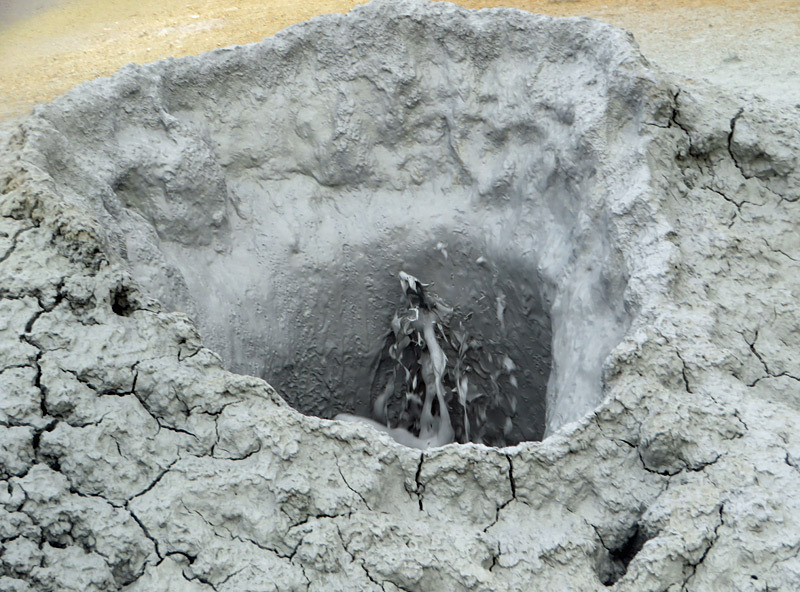 The mudpot craters were full of gray, gurgling mud, and the fumaroles emitted horrifyingly-sulphur-smelling gas. This quirky, alien landscape was one of the most unique regions of Iceland. If you’ve ever seen a cool photo of Reykjavik from above, it was undoubtedly taken at Hallgrimskirkja, the iconic church that is one of Iceland’s tallest buildings. 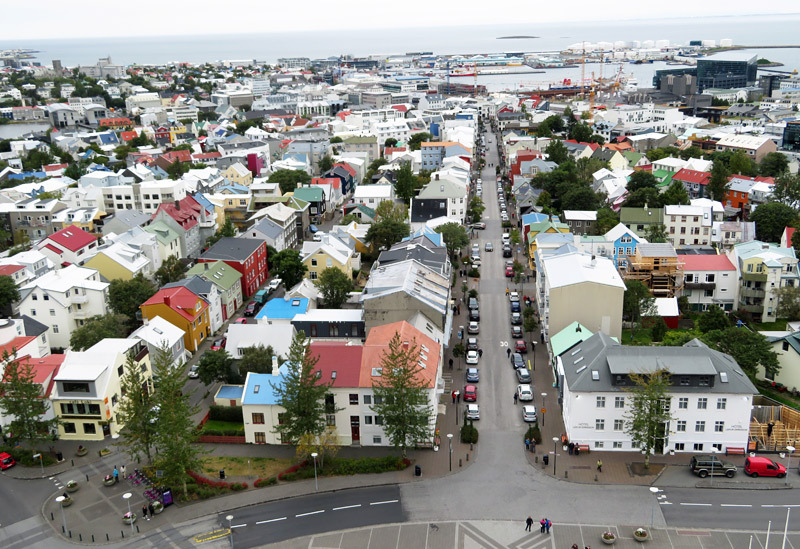 What an awesome way to see the colorful houses of Rekjavik. 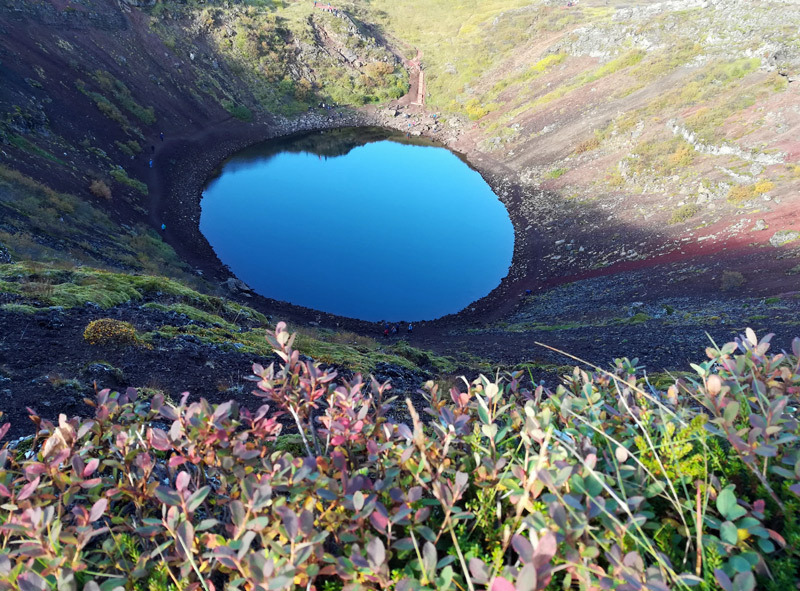 Iceland has several volcano craters that visitors can walk inside. Kerid is one of the best because it has a wide caldera (almost 900 feet across) and a lake inside. It’s also visually compelling, because Kerid is made of red rock, which contrasts against the green and yellow vegetation growing inside. This caldera, formed during an eruption 3000 years ago, has a trail leading all the way down to the lake. 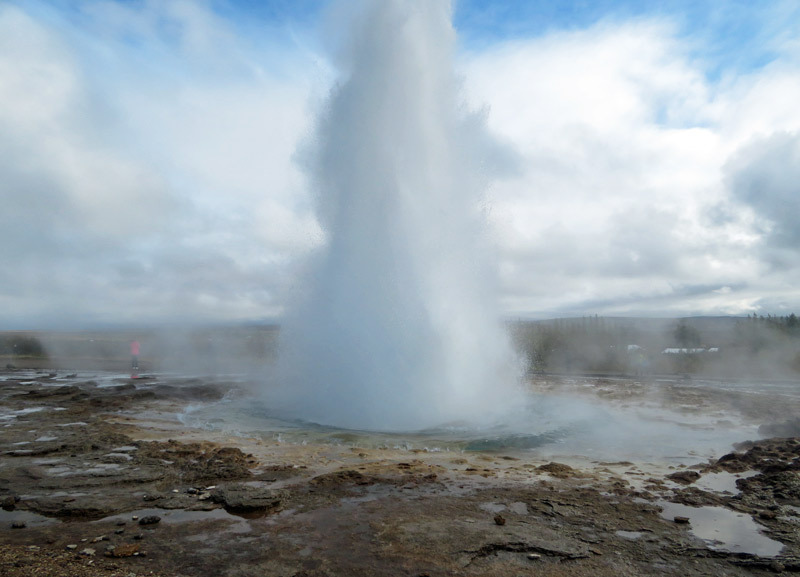 The most famous geyser in Iceland, called Geysir, goes through active and dormant stages. During my visit it was quiet. But its nearby cousin Strokkur was very active, erupting every few minutes. 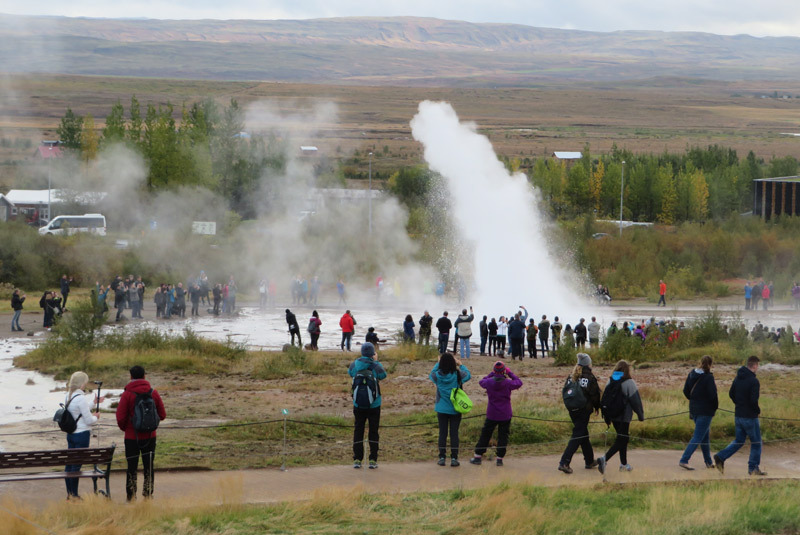 Tourists gathered around with their cameras to try to time the eruptions. Just another reminder of the power of mother nature. Þingvellir (Thingvellir National Park) is a UNESCO World Heritage Site. 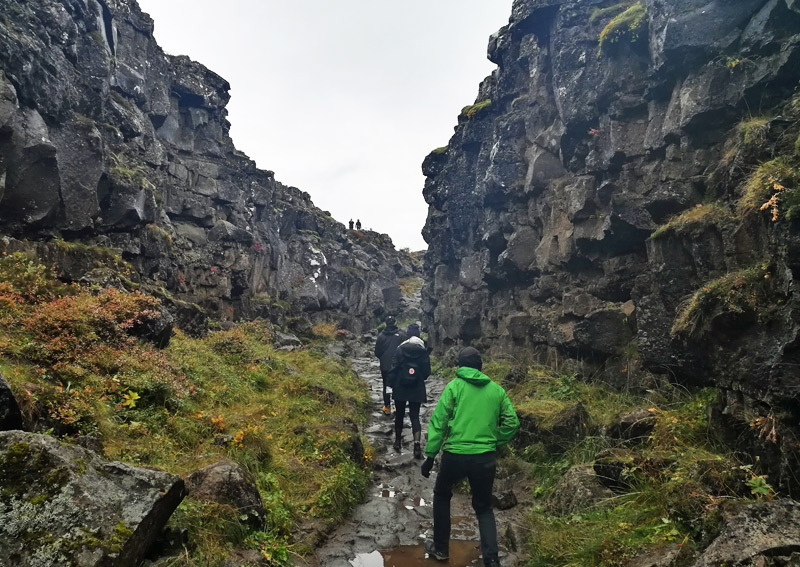 It’s the spot where the Eurasian and North American tectonic plates meet. The plates don’t actually touch – they are roughly 20km apart, and moving another 2cm further apart each year. Thingvellir is essentially the valley between the plates. Seeing evidence of the earth pulling apart was very cool. 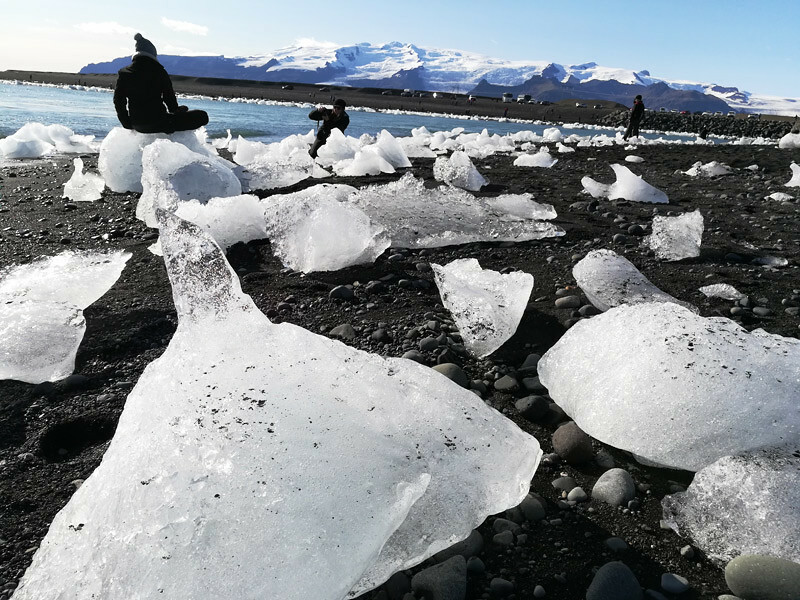 Jokulsarlon sits right at the base of Iceland’s largest ice cap. It’s the deepest lake in the country (800 feet) and it’s full of huge chunks of glacial ice bobbing around. 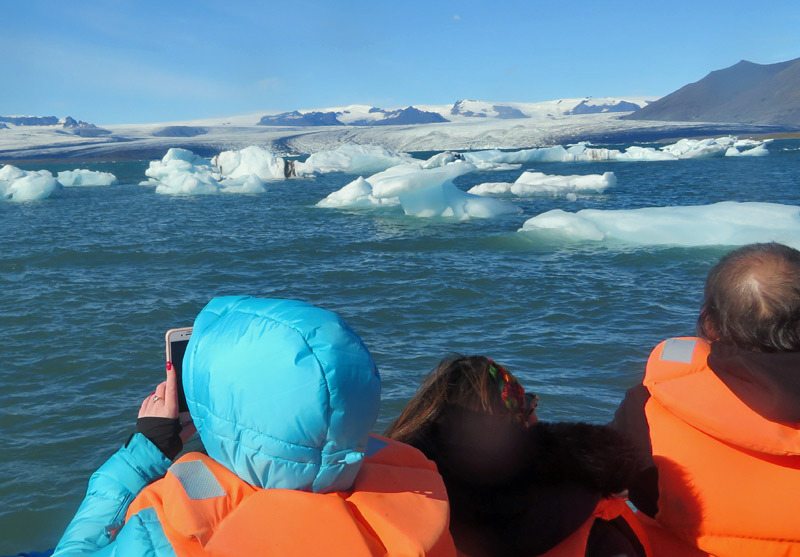 We took a boat ride in the lagoon to get an up close view of the glaciers. 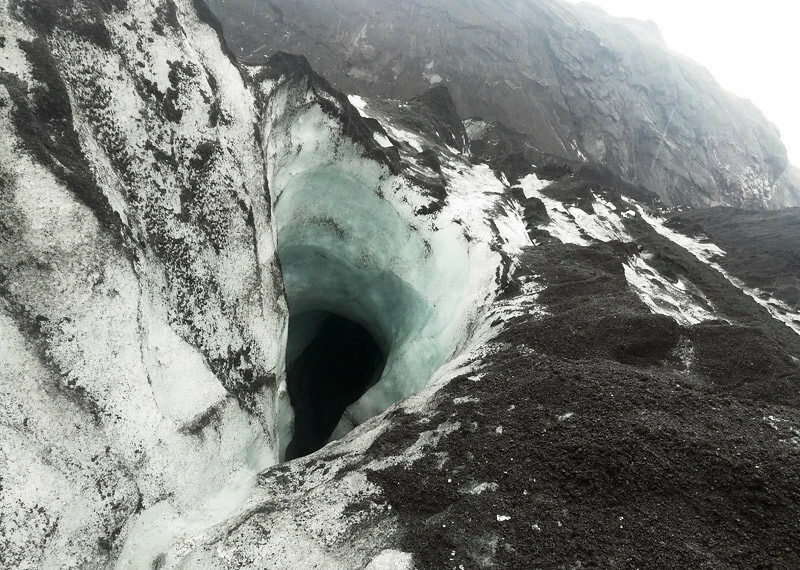 There’s nothing quite like hiking inside a glacier. 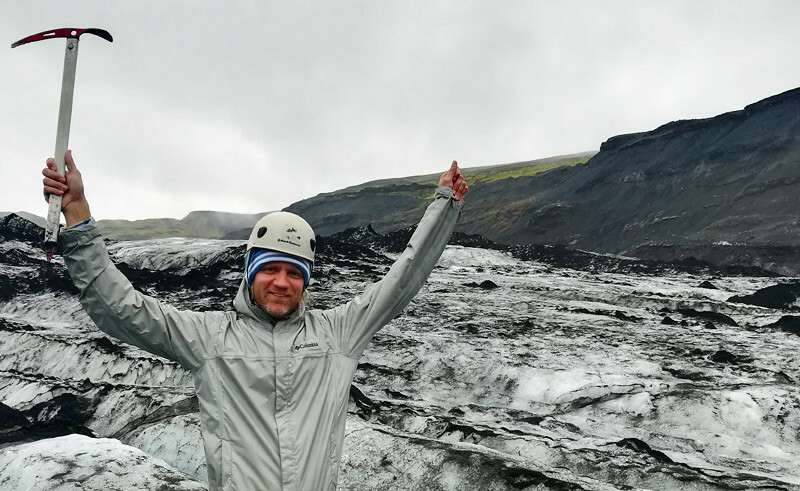 The trek inside Solheimajokull was a memorable experience. Once we put on our crampons, the hike was pretty easy, following an established trail to the top of the glacier. 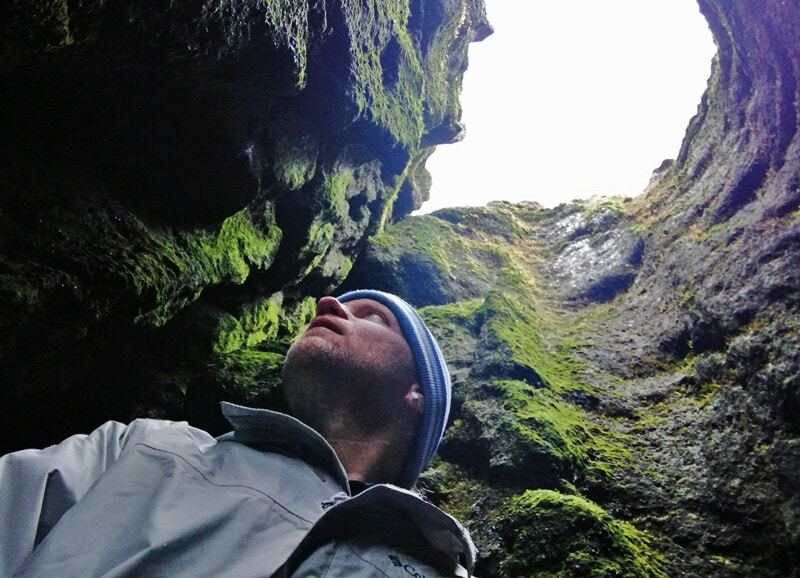 We drank water directly from glacial streams and stared into dangerous crevasses. You do not want to fall in here! Aurora borealis! 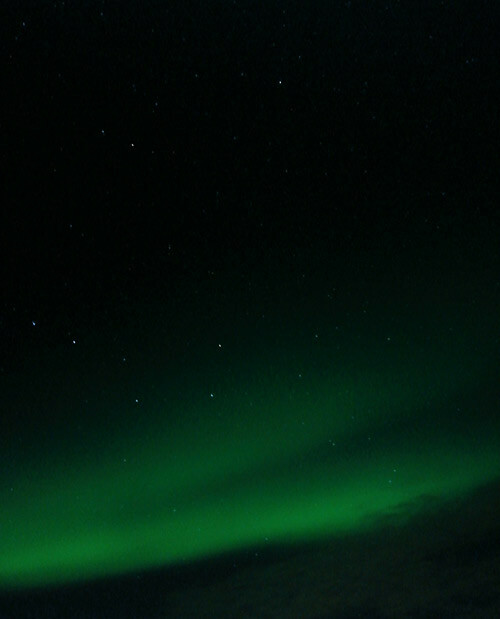 During our first eight nights in Iceland, the sky was too cloudy to see anything. But night #9 brought a dancing sky. I got to see the Northern Lights for the first time, while sitting on a secluded street in the heart of Reykjavik. But on this night, I didn’t care much about the photos. I just wanted to sit back and witness the event with my own eyes. And it was a magical experience. 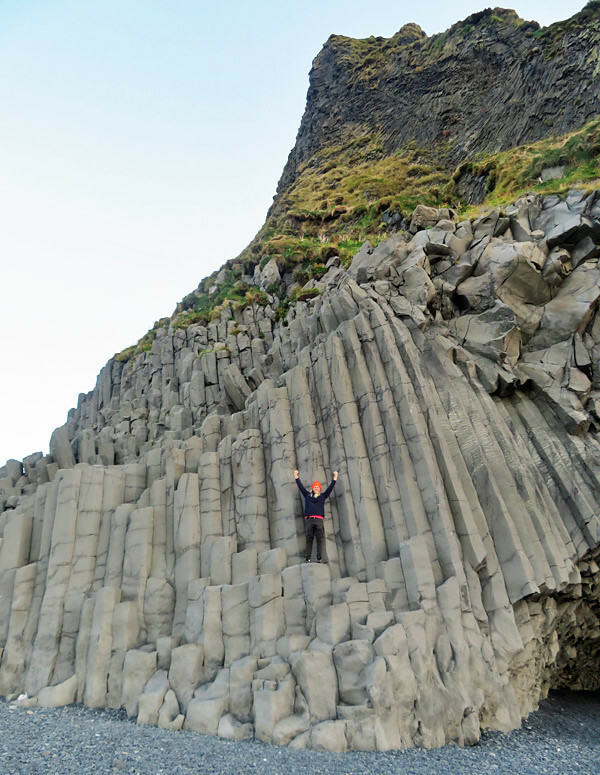 Iceland has several black sand beaches, but Reynisfjara is special for several reasons. 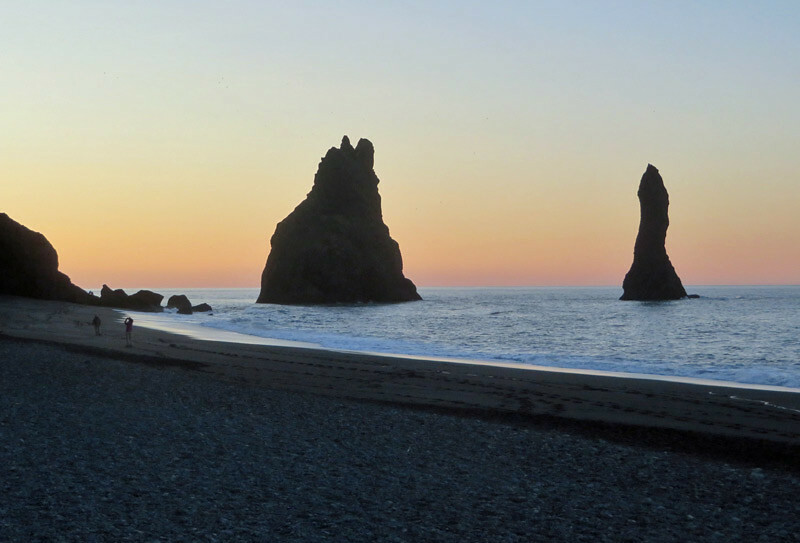 This beach in Vik is known for its basalt sea stacks, which are columns formed by the cooling of lava. Somehow they harden into these awesome geometric shapes. I could’ve played on these for hours. 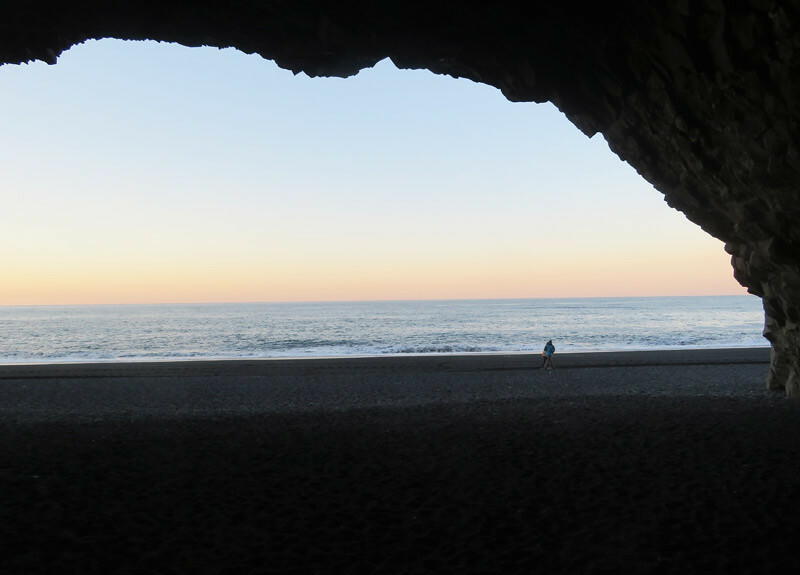 There’s also a cave underneath some of the columns, and a rock formation out in the ocean known as Reynisdrangar. Lots of cool natural sights. Obligatory disclaimer: Multiple tourists have died at Reynisfjara when sneaker waves crashed in and dragged them out. So come here and get your pictures, but don’t linger longer than necessary. You might think that after encountering hundreds of waterfalls over 10 days in Iceland, at some point I would have become waterfalled-out. But it never happened, because they were all so beautiful. 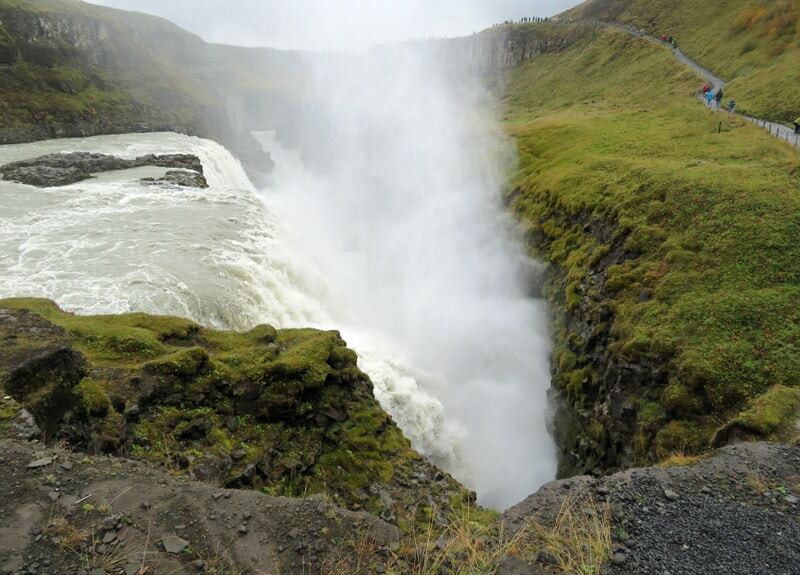 Gullfoss, in particular, was spectacular. It was one of the biggest waterfalls in terms of size and scope. As I walked up to it, I first saw the smaller falls off in the distance. Then I noticed the tiny people standing next to it. Wow, you can stand right next to the falls! Walking closer, the higher falls just over the hill came into view. 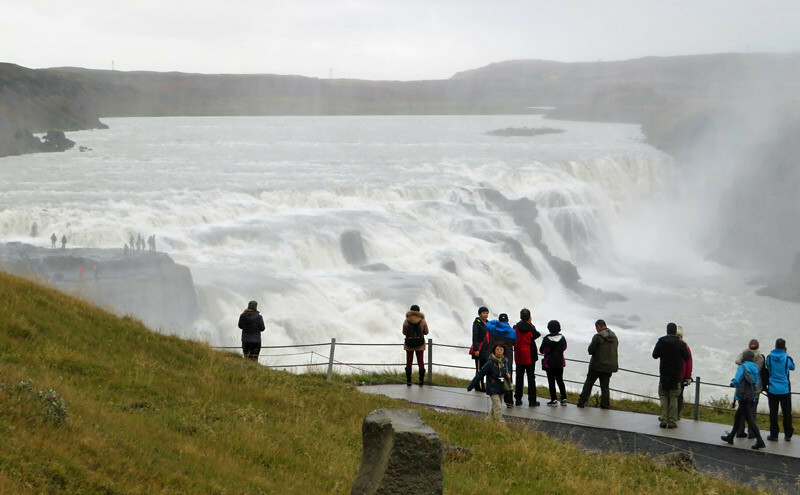 Gullfoss was one of the loudest and most powerful falls in Iceland, and it splashed a lot of water on us as we walked the path, so it tickled several senses at once. 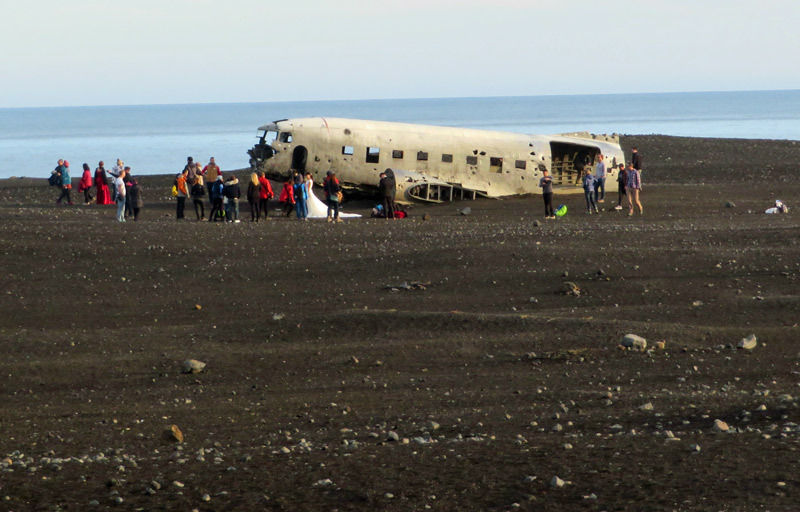 Right across the street from Jokulsarlon Lagoon sits Diamond Beach. This is the famous spot where glacial ice washes right up on the shore of the black sand beach. It created a visual scene unlike anything I had ever witnessed. We picked up some of the smaller ice chunks. 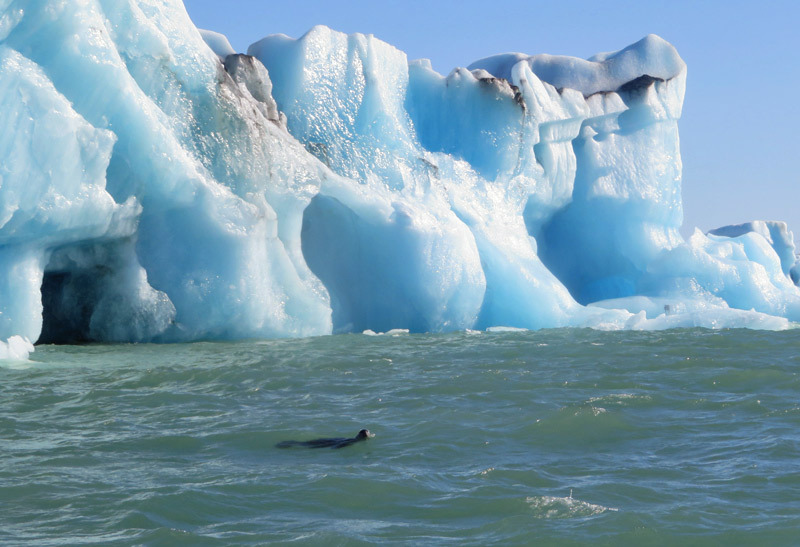 We ran around the beach, weaving in between glacial ice. We sat and watched the ice wash up in heavy waves. And then I jumped on a piece on floated out to sea! On the drive to Akureyri, we were running a little behind schedule, due to making so many roadside stops to look at the amazing scenery. 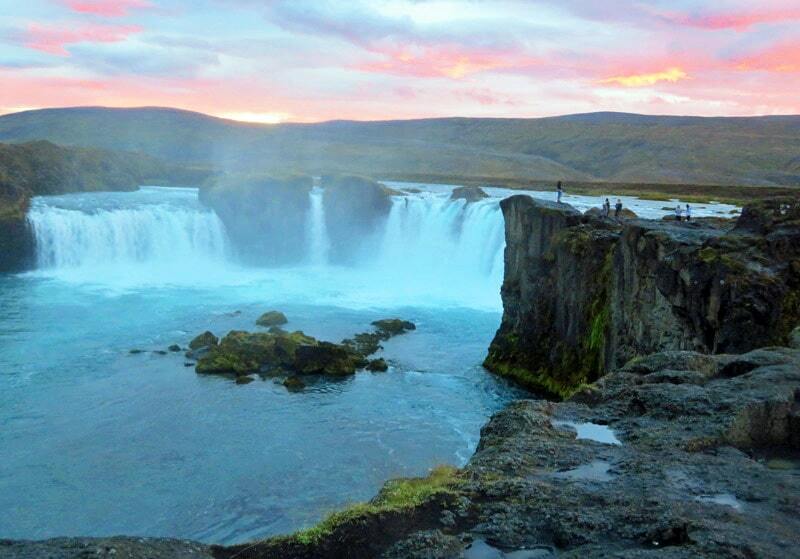 Thus, when we reached the Godafoss waterfall, the sun was already setting. The falls themselves were stunning – wide and powerful, vaguely similar to Niagara Falls. But seeing the falls in front of a majestic sky of yellow, orange, and pink? Simply unforgettable. 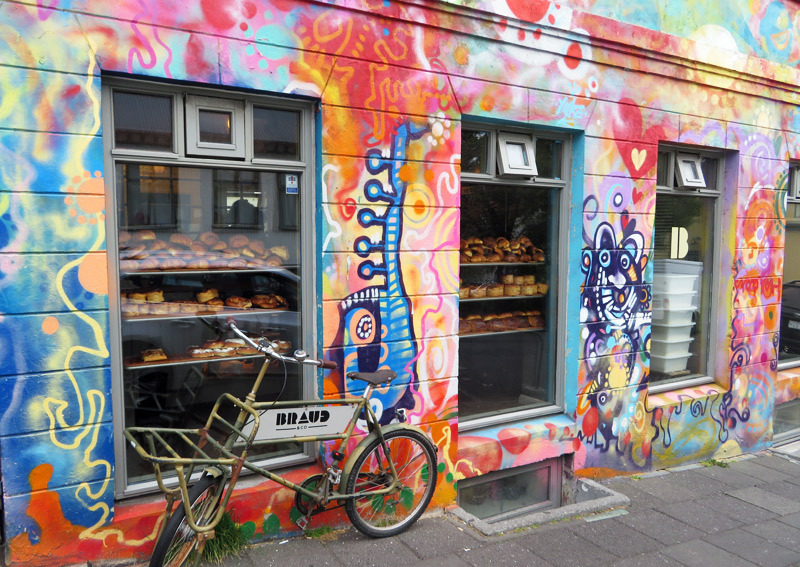 RELATED READING: See even more Iceland photos with The Quirky Side of Iceland photo essay! Thanks Agness, I love this country! Amazing food and pictures. Iceland is most beautiful place for holidays and traveling. Thanks for the sharing useful information. Thanks Mike. It’s one of the most beautiful. 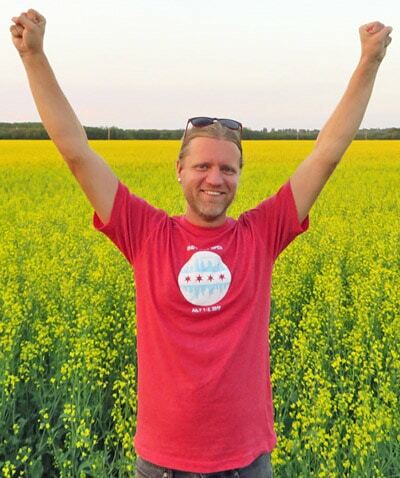 Awesome work Scott. My wife and I toured Iceland around ring road for 7 nights. Best trip ever – and we’ve done our fair share of traveling. I think about Iceland daily/weekly. Probably daily as it’s we’ve placed a picture of us hiking the glacier on our main credit card – thanks capital one! We’d like to go back (it’s been 4 years) and visit the Snaflugus peninsula and see the iconic reindeer as well as the artic fox. We went in the summer so we’ll have to do a quick trip in the winter. It was one of my favorite trips ever as well! 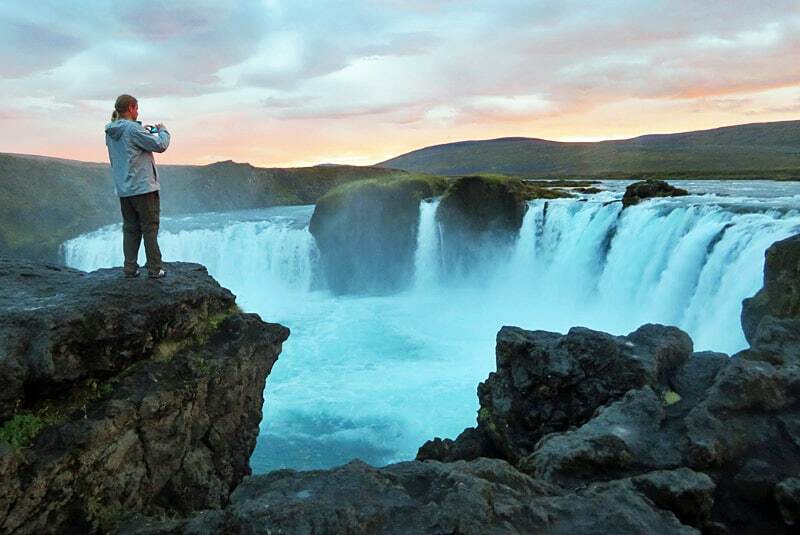 Iceland is magnificent and your pictures just prove that, Scott. Great post! Thanks Agness, this country is amazing. It’s hard to pick one answer since all those places are really impressive. 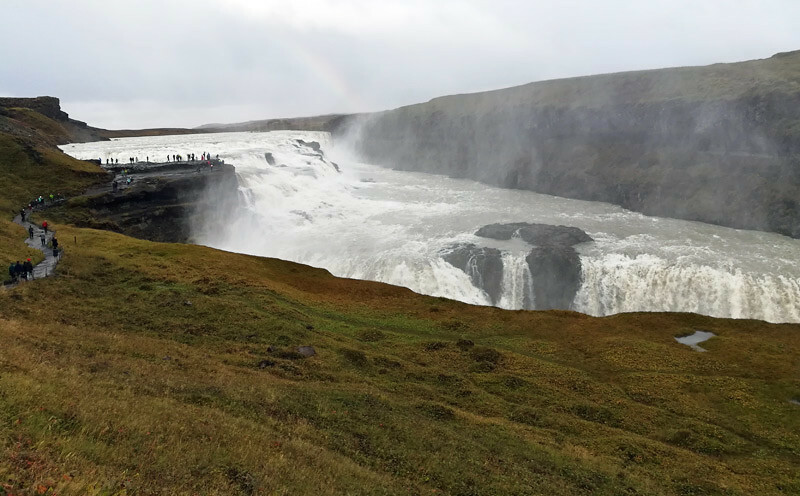 Iceland definitely has amazing waterfalls and the one with a rainbow over it is my favorite. I also loved the sheep and horses they’re so cute I could pet them all day! Yes, seeing the waterfall rainbows was great! Good list. I was up there for 10 days and didn’t see most of this stuff. You have to be there for months to see everything. 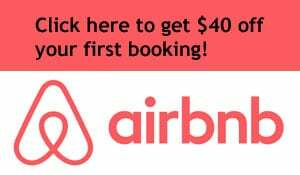 I’m already thinking about my next trip. 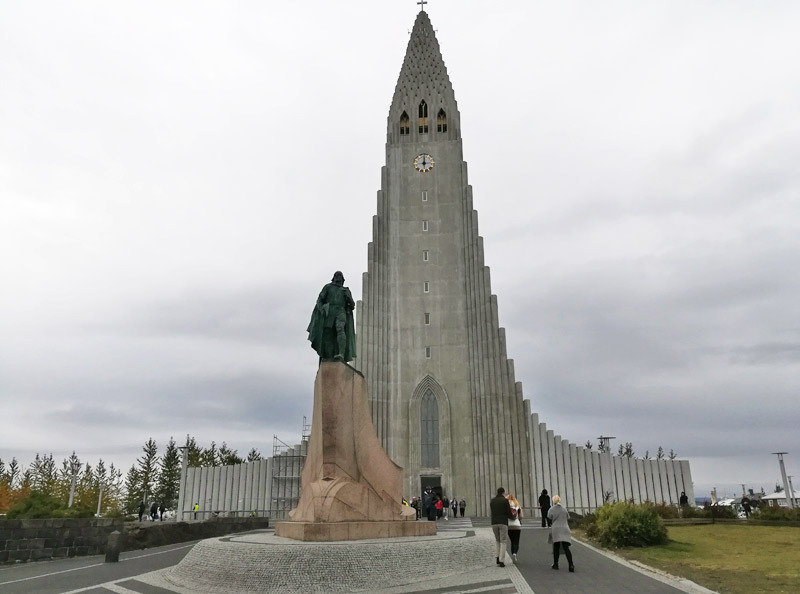 I might like to stay for a month in Reykjavik and another month in Akureyri and take day trips from there. Or spend a couple weeks driving around the Westfjords. It never stops. I got the idea to cycle the West Fjords at some point. 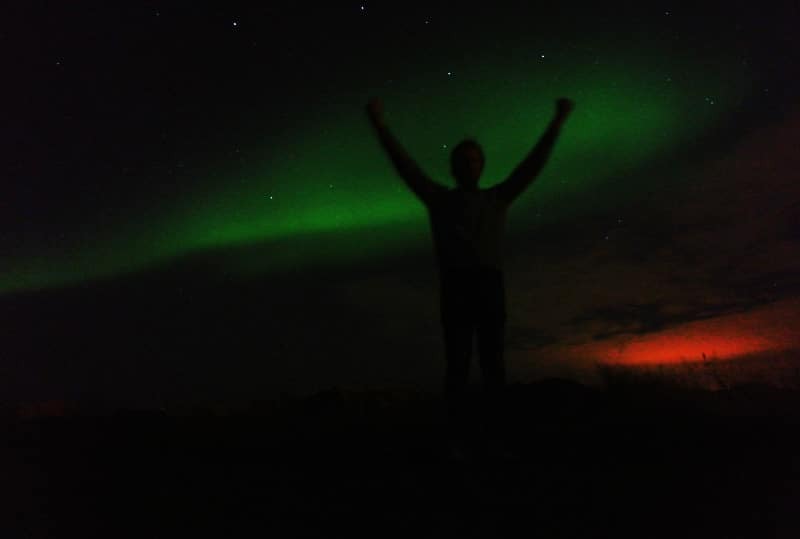 Actually I’m going back for New Years for Sigur Ros and hopefully some auroras. Crossing my fingers that the recent volcano activity won’t throw a wrench in my vacation. Wow, nice. Sigur Ros is my favorite band. I think it would be an incredible experience to be there for the festival. Four Interesting Driving Tours around Washington, D.C.